Most ridge cap tiles in South Africa, are secured to the top of the house with conventional concrete. Concrete is difficult and messy to work with and in this situation is not very long-lived. Extremes and changes in temperature causes the concrete to crack and break loose over the years, resulting in the ridge cap tiles working loose, creating leaks and possibly even blowing off in strong winds. Therefore, continual maintenance is required to prevent this from happening. Monier Coverland’s system works differently. This new (to South Africa) system has been tested in Germany and has been in use in Europe for some time. Instead of being cemented into place with concrete, this system uses brackets to attach the ridge cap tiles to the roof. A breathable, self-adhesive membrane keeps the rain out and allows hot air to escape from the ceiling cavity. Easy roll and stick application; no messy mortar or the inconvenience of mixing and carrying mortar. Approximately 2.5hrs/10m roof versus mortar approximately 6hrs/10m roof. Light-weight, demanding less effort to install than mortar installations and less mess. Ensures no cracks or leaks normally attributed to mortar applications. Ridge Roll allows for expansion and contraction of the roof, resulting in a maintenance-free ridge and hip-line. The Ridge Roll assists in preventing mould and damp that rots the timber and damages the roof structures. No long-term maintenance associated with mortar bedding. The components of the system ensures that the tiles are securely fastened for maximum protection against the elements. Offers better resistance to wind uplift and water penetration. High quality design that is aesthetically pleasing. Suits most concrete roof tile profiles. If that’s not enough, Monier Coverland have just informed me that they are soon going to be releasing a new product, the Figo Roll, which is similar to the Compact Roll but has some new features. I look forward to finding out more about the new features on its debut in South Africa. 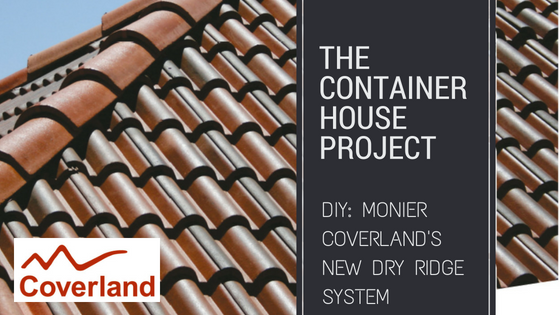 Most of Monier Coverland’s products are stocked at Builders Warehouse, but should you wish to contact them directly to find out more about this and other amazing roofing products, you can visit their website here. Monier Coverland has several branches throughout South Africa. Visit their contacts page on their website to find a branch near you. As we await the corrected plans from the architect, we also have to consider enlisting the services of a Geotechnical Engineer. The structural engineers wish to have a soil analysis done by a Geotechnical Engineer in order to correctly design the footings. Great product! Anything to simplify building and construction systems. I wonder how much it affects energy calculations though – but I guess the breathable quality would help…? Monier are highlighting the breathable aspects of their compact roll which allows hot air to escape the roof cavity, so I did presume it does help with energy saving. Older houses have breeze blocks in walls for this purpose – another reason why I would think it does help (similar idea). Never gave much thought to roofs before but that was very interesting. I am so glad you found it interesting. It’s true! You don’t think much about your roof unless there is rain and it is leaking.